Hello! I am Stefania, I am from Romania, but will soon move to Belgium. Travel is my passion that I have discovered 3 years ago and can not get enough of it. 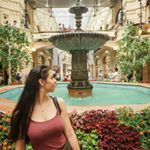 I noticed that there are a lot of beautiful places and experiences that people may not know about and that's why I want to share and create awareness for the hidden pearls of the globe. Get personal, create unique stories and memories. People love that. The biggest goal is eventually making a business out of this, that will allow me to interact with my fellow nomads, while also discovering the world.